As you have noticed, I am far behind on sharing my news here, so I am going to try to catch up over the next while as my day job quiets down just a little for the summer. In my brief stop at Quilt Canada at the beginning of June, I was able to see the quilts in the show (you can see them all the quilts in the show to by going here). They were truly all fantastic, each quilt a winner in my mind. It was such a treat to see them in person, and I sure wish I had been able to stay longer. My first news is that Echoes won the first place spot in the Original Modern Wall or Bed Quilts category at the Canadian Quilters' Association National Juried Show. I was able, very briefly, to stop in and attend the awards ceremony and spend a couple of hours at the show before I had to head off for more work related travel. It turns out that one cannot take photographs at the show - but you can see all the winning quilts here). Here is Echoes on my king size bed after she returned from the show. It is really hard to photograph this quilt well as she is about 70" square. Echoes is my design and she and her pattern appeared in the QuiltCon Magazine which you can buy from Interweave here or you can get the single pattern here (and it is even on sale today). I am very proud of this design and have some variations that I am working on now. Thank you so much to CQA and to eQuilter.com which sponsored the $1,000.00 (I know, gasp!) prize, I am thrilled and honoured to have won this ribbon and prize. Having said that, I did not expect Echoes to win a ribbon, and certainly not first place. My original blog post about Echoes is here and if you look very closely at the photos in that post and this one, you will see that not every point was perfectly pieced. Don't get me wrong, they are pretty excellent, and it is really hard to perfectly piece these curved points perfectly, but I know that I could have done a bit better if I had worked harder. The judges came up to me at the Awards Ceremony to chat about my quilt. I did not ask they why it won, but it was clear by their comments that it was the minimalist design on the large quilt that won the day. So there you go, don't stress about every tiny bit of perfection, just enter your quilts in shows. Successful design elements allowing effective amount of negative space. The variegated thread is a brilliant design element that elevates the quilt through the parallel line quilting. Pay attention when joining your blocks as high contract will display inaccurate seams. This quilt delivers a bold visual impact achieved through the position of the blocks that add dimension and colour. 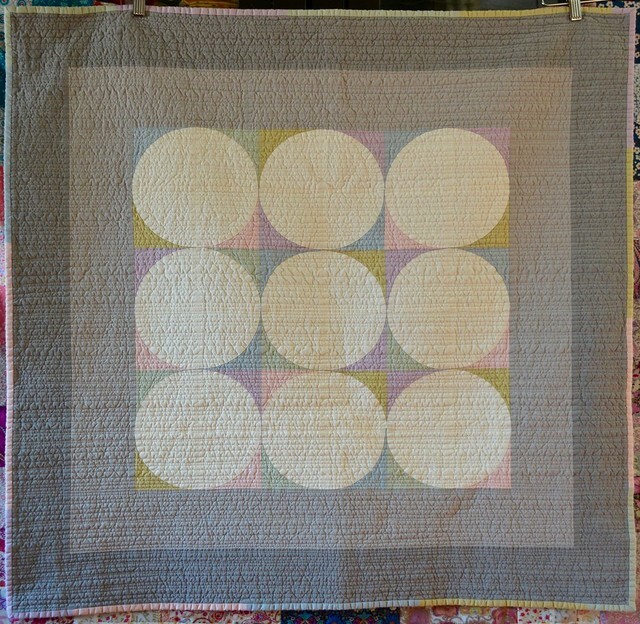 The echo quilting, using variegated thread, adds texture and interest throughout the negative space. Interesting choice of backing - always exciting to get a little "surprise"! Ensure the quilt is square when finished. 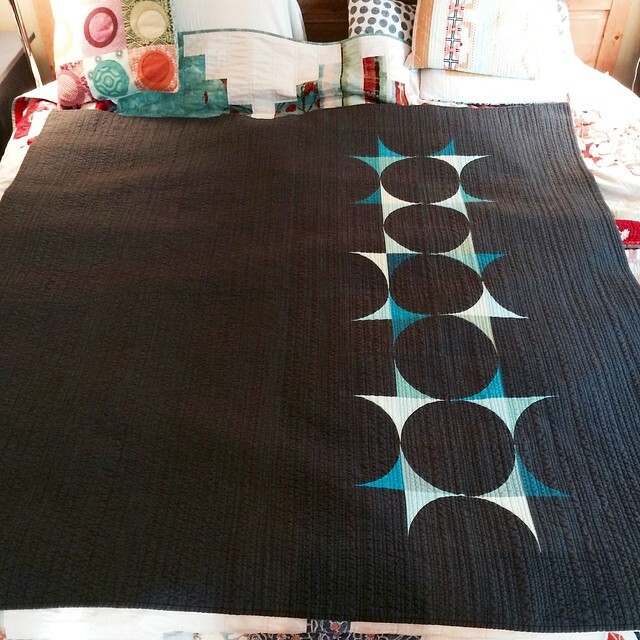 Choice of colour and the asymmetrical, linear placement of a simple repetitive form on a large dark negative space has created a stunningly sophisticated quilt in keeping with the modern quilt aesthetic. The closely spaced linear vertical channel quilting adds appropriate and dramatic visual texture, creating balance in the overall composition. Added attention should be given to finishing techniques. Hint was also hanging in the show, in the same category. This is the quilt I expected would take a ribbon, she is a perfectly constructed as I was able when I made her. Hint is also my original design - another in my cycles series - and she was designed and made for Oakshott Fabrics. You can purchase her patten and a kit of the fantastic Scandinavia fabrics she is made from here. Michael Oakshott kindly sent her back to me for the show - where she looked stunning hanging on the black background fabric - and she is going home this week. Hint received similar comments from the judges, they loved the design, quilting and backing, and they suggested that the binding was not perfectly stitched and that I should check better for loose threads. My original blog post about Hint is here. 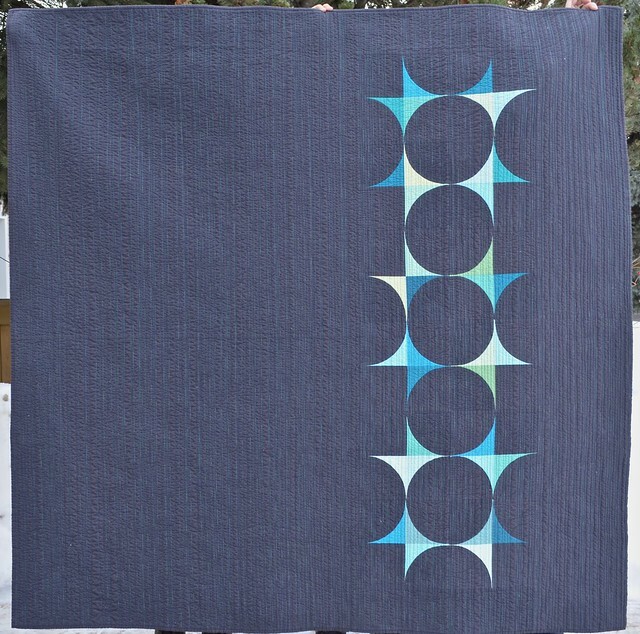 I am so in love with this quilt and pattern and am plotting with Michael to make a bed size version this summer. 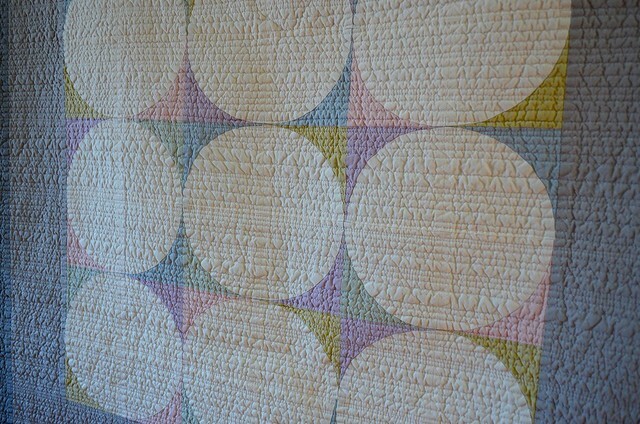 As you can see from the photos, both Hint and Echoes have been washed to bring out the texture of the linear quilting. Here is Landmarks 2 (original blog post is here). I was invited last summer to make this little quilt to be part of the CQA's travelling exhibit "It's Time For Colour". The last stop on the tour was Quilt Canada, and I was allowed to take her photo. She, and all of the other quilts in the travelling exhibit, has been sold, with the money raised going to the Children's Wish Foundation of Canada, so this was my last chance to see her in person. I also got a chance to see some old friends and to meet some new ones - although not as many as I hoped, as I had to rush back to work. 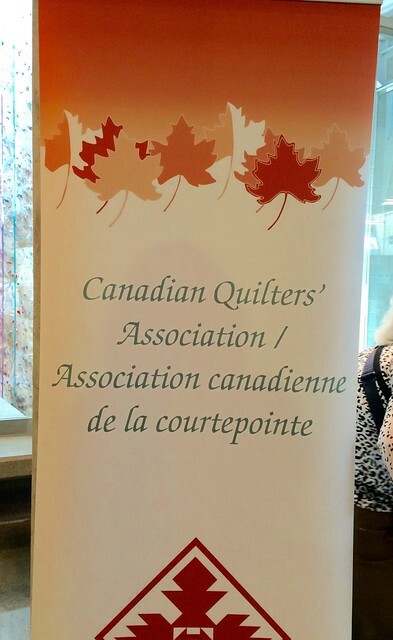 The Canadian Quilters' Association does a beautiful job with Quilt Canada, and I hope to be able to attend for longer next year. I hope to see you there. Oh, good for you! Good for Echoes! Your quilt is beautiful and really deserve the 1st place! Congratulations on having your quils juried into the show. 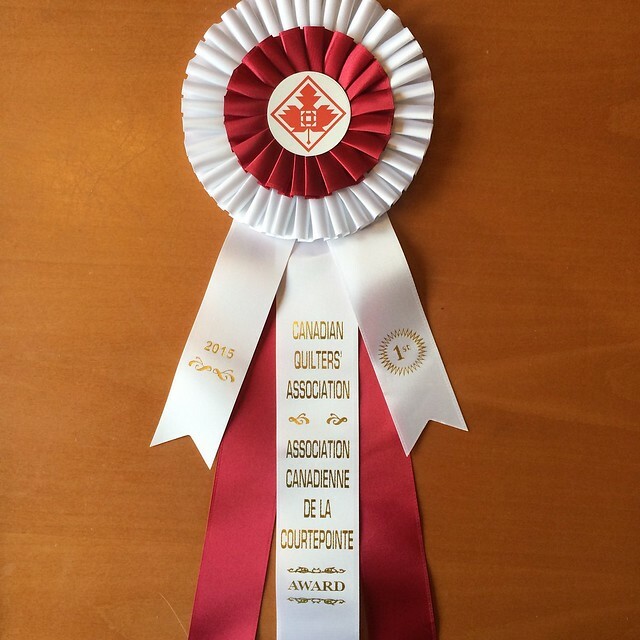 Big congratulations on the ribbon - so exciting and well deserved. Thanks for sharing the judges comments and giving a little insight into their thinking. Congratulations on your win, and indeed it was lovely to see all of these quilts again. Thanks for sharing the judges comments - very interesting! many congratulations! great prize too! Congratulations: a well deserved award. Wahoo! Congratulations and well done, Leanne. Congratulations on your award! Echoes is beautifully deserving. Congratulations !! This is fantastic! Oh gosh that is amazing! You're an unstoppable force! Congrats on your well-deserved ribbon! Congrats, Leanne, on a well deserved win!!!! I truly love this series of quilts!! i am curious about your sliver coloured thread spool holder that is at the back of your Janome. is it an attachment that you can order for the horizon?? or is it something you had custom made?? Congratulations! Thanks for sharing pics of the sign and your ribbon. Now I know the French word for quilting! And a big congrats to you on your win! Hint is the one I'm in love with, but that's probably because the colors are more subdued. :) All three are very you and something to be proud of! So happy for your win--and your recognition! That is a great looking ribbon there, with the maple leaf front and center. I'd be thrilled to have one of those too, to go with your others. Your quilts are doing quite well, as well they should, as they are interesting to look at and well constructed (even though you can see the points that are slightly off, we can't). 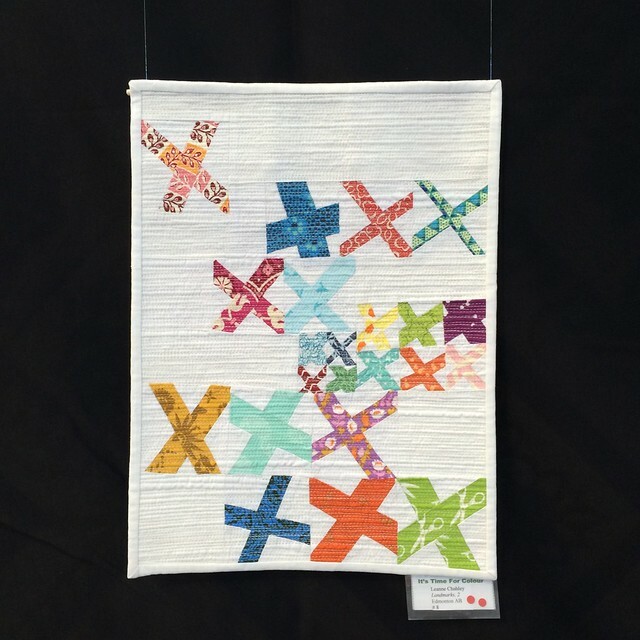 And I love that X's quilt at the end--reminds me of one of the Art Quilts you did. Maybe that was your sketch for this one? Your work is always fascinating and pulls me in for a second and third look. Congrats on the win. The show was in our city and it's interesting what different quilters thought of the show. Anyone I talked to did not think the show was that good myself included. I was very disappointed in it. We did enjoy the vendors though. I remember your quilts from the show. They caused my family and I to stop, talk and discuss. Congratulations on your win. I absolutely agree with the judges' decision. I have signed up for their newsletter :) I've tagged friends on your IG giveaway post so they can enter to. Where I live its always summer so lots of outdoor play and lots of quilting these school holidays :) I don't like to post my email so my IG name is ljhamann69. Congratulations Leanne! Your quilt is stunning! I'm also a bit behind :) Congrats! It is a beautiful quilt! Congrats on another well deserved win Leanne. You may be behind in posting news but I'm much further behind in reading blogs lately. Scraptastic Tuesday June Link Up Winners!